Dimensions : 90 H x 175 W x 68 D cm. Original : Château de l’Isle-Marie, Normandie. 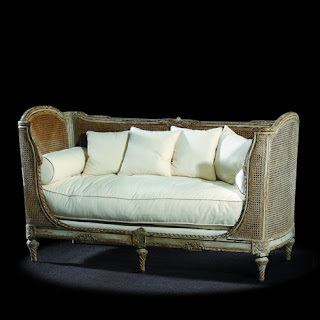 An unavoidable charm is apparent in this double-Caned Couch sofa that presents to the layman a virtuosity of line and uncommon sculpture. 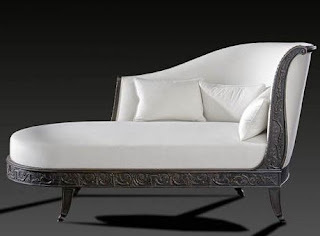 Several original points emerge from amongst the detailing : the crossbar in cradle, the armrests that come back as if lightly imprisoning the user, the delicacy of the backs and sides, the ornate feet of twisted fluting. 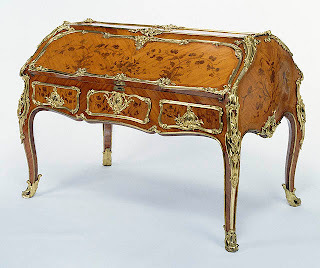 One can notice how the style of ornamentation and form probably refers to the early period of Louis XVI style, around 1775, that is customary to call « greek style ».